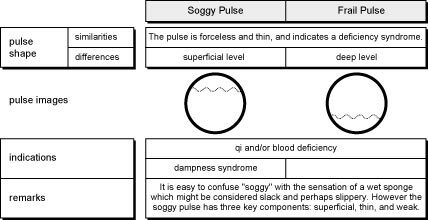 Indications: damp depresses the vessels, qi and blood cannot easily flow through the vessels leading to the thin, forceless and ultimately rootless pulse. Deficiency syndrome: yang loses its root when qi, yin or blood are deficient. Explanation: I really don’t like the way that the major publishers have chosen to name this pulse. “Soggy” suggests the sensation of a wet sponge. While the “ru mai” characters do include some references to a leaky roof or water, the term “soggy” remains confusing to the modern-day practitioner. I would rather that we refer to this pulse by its better description of “weak-floating-thin” or as Bob Flaws says (over and over and over) “Floating, fine, and forceless!” Stop looking for a soft or soggy sensation and focus instead on its depth (superficial), its width (thin) and its strength (forceless). That’s a soggy pulse. As for the mechanisms, we’re still hanging out with what was described earlier in this course in regards to the thin pulse suggesting dampness depressing the vessels such that the qi and blood cannot easily flow through leading to that thin and forceless pulse. The floating and forceless aspects of this pulse can also be associated with some long-term deficiencies of yin, blood, or qi. Next: prepare to feel a little faint.